Baker linked with Leyton Orient. 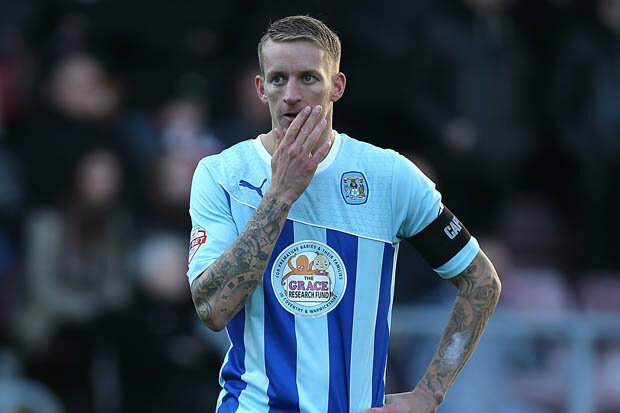 Former Coventry City captain Carl Baker has this weekend been linked with a move to fellow League One side Leyton Orient. Baker, 31, is currently the longest serving player at The Sky Blues having signed for the club in January 2010 from Stockport County for £300,000 and has gone on to make 182 appearances. Baker was appointed club captain by Mark Robins in September 2012 but last week Steven Pressley decided to give the armband to new signing Reda Johnson – a decision Baker was “gutted” about. Now the League One Play-Off runner’s up, Leyton Orient are reportedly interested in taking Baker to The Matchroom Stadium as a replacement for Moses Odubajo who joined Championship side Brentford earlier this month. Baker missed the club’s pre-season tour of Italy this week after suffering a shin injury in training last Friday and should be join up with The O’s he will join former City loanee Chris Dagnall who spent a month with the club last December. « van Aanholt joins Sunderland.